A necktie is an important part of any man’s wardrobe. This accessory upgrades nearly any collared shirt to a more formal one and is a daily need for a wide range of careers. If you need a new tie, be sure to look at more than just the price tag and the pattern before you buy. It may seem like a simple accessory, but you don’t want to waste your money on a poor-quality tie. Instead, find something that brings style and quality to the forefront and fits your budget. So how can you spot a quality necktie? One of the first places to look is the material. High-end ties are typically 100% silk, though you may want a tie made from another material in some situations. Lower-quality ties tend to be made of inexpensive or thin materials that fall apart more easily — don’t sacrifice quality on a tie you want to wear to work or make a long-term part of your wardrobe. And while price doesn’t always indicate quality, you can generally expect that ties below $15 won’t hold up well. The highest-quality ties tend to fall in the $40-and-up range, but you shouldn’t feel obligated to spend more than $40 for something nice. If it's much more expensive than that, you’re probably paying for the brand name more than anything else (and there’s no need to waste hundreds of dollars on an ordinary-looking tie just because it has a designer label on the back). But the most fun part of tie-shopping is choosing the style. Just like your dress socks, your tie is one place you can play around with your wardrobe and express your personal taste while sticking to that office dress code. Read on for our picks of the best ties you can buy today. 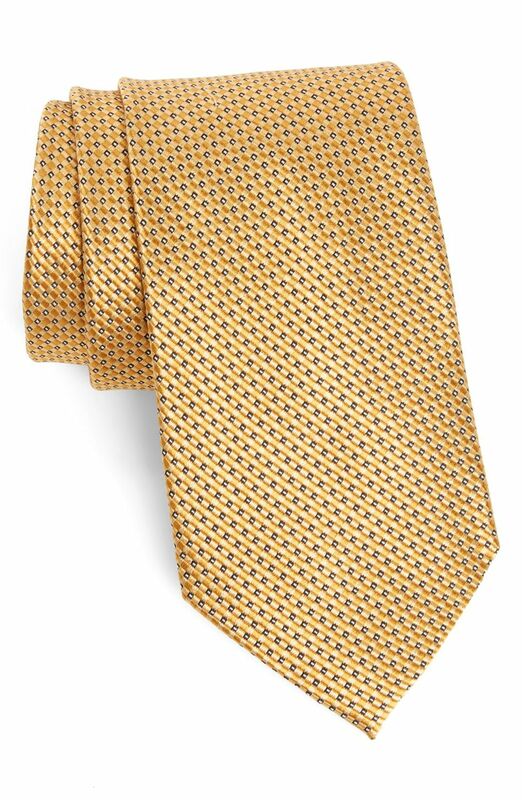 Nordstrom Men’s Shop offers high-quality ties in great styles at a reasonable price. With near-perfect customer ratings, you know you can count on these ties to last a long time. They're made from silk, so you can wear them to social or professional events and confidently look your best. These ties range from around $40 to $80 in price. While they are not the cheapest ties out there, you get a lot for your money. Nordstrom is known as a high-quality brand, so you can count on getting designer quality at a non-designer price. The Brooks Brothers brand has a long tradition with men’s clothing. If you want a high-quality tie in a classic style, Brooks Brothers has a tie for every occasion. These ties are mostly 100% silk, and while they tend to cost less than high-end designer brands, they do skew higher than the average tie reviewed (typically around $50 to $80). But you know with Brooks Brothers you have something you can feel confident in. The Brooks Brothers look never goes out of style and these high-quality ties pair well with any dress shirt, sports coat, or suit. From one of the world’s most classic brands comes the Burberry Manston tie. Burberry is a British luxury brand known for its trademark scarves and other items. With this tie around your neck, you’ll look your best at any social or professional function. It comes in the iconic Burberry colors and is sure to add a touch of high-end luxury to your formal wardrobe. While it does come with a high price tag, this tie is timelessly stylish and true Burberry quality. Calvin Klein ties typically fall into the $20-$30 price range and offer modern styles targeted at young professionals. These ties are generally 100% silk, so they look good and give you the shine and quality you would expect from a high-end silk tie. But unlike some designer brands, you don’t have to pay a high-end price at checkout. Choose from a wide range of stylish patterns in this classic neutral, or look through their other ties online for bolder color options. From Amazon’s own brand Buttoned Down, this is a high-quality tie for a surprisingly low price. It comes in 27 colors and two sizes: regular (58” length) and extra-long (62” length). The three-inch-wide tie is 100% silk and comes with an unconditional satisfaction guarantee. This tie is also available in both plain and patterned options that are appropriate for work, date night, and more. Amazon’s Buttoned Down isn’t done just yet. If you are looking for a skinny tie that offers good value for the cost, Buttoned Down’s skinny tie is a great option. At two inches wide, it has a classic skinny-tie style. You can choose between three colors and regular (58”) and extra-long (62”) lengths. While the tie is 100% silk, it is textured and not a smooth material. It isn't the most high-quality tie out there, but at this price point, you get a great value for your money. Deciding on the perfect interview tie can be tough. When in doubt, go with a classic style that complements your wardrobe without distracting from what the interview is all about. This tie offers a classic red-with-blue-stripes pattern that looks professional and exudes confidence. The tie is 100% silk and comes in four colors. The yellow, blue, and orange colors are great options, too, but you may want to stick with the red and blue stripes for an interview. And with Tommy Hilfiger, you know your tie will likely last far past the first interview and well into your career. True Star Wars fans (and maybe even aerospace engineers) will enjoy this tie that shows a blueprint of the iconic Star Wars ship The Millennium Falcon. Available in six colors, this tie is 100% polyester and a great conversation starter. It makes a great gift for the Star Wars lover in your life, or a fun addition to your wardrobe if you want to show off your Sci-Fi side.